BirdRock Home Acacia Wood TV Tray Side Table | Set of 2 | Industrial Design | Natural Wood Bed Sofa Snack End Table by BirdRock Home at RVTE. Hurry! Limited time offer. Offer valid only while supplies last. BirdRock Home Acacia Wood TV Side Table Set is the perfectly crafted industrial designed side tables providing a warm and handsome touch to any room. BirdRock Home Acacia Wood TV Side Table Set is the perfectly crafted industrial designed side tables providing a warm and handsome touch to any room. 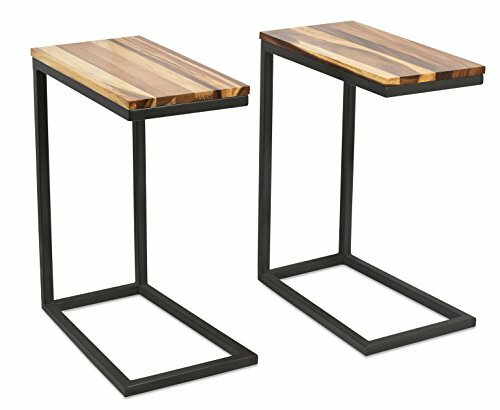 The side tables are crafted with a "C" frame made of durable square metal tubing supporting an Acacia hardwood top that is hand-picked and unique for each side table. The side tables have been innovatively built to simply slide under a low-clearance sofa allowing you to place snacks, cups, plates, laptop, iPad, books, magazines and other living room essentials upon. The side tables arrive to your doorstep fully assembled allowing for immediate use. Touch up your living room with BirdRock Home Acacia Wood TV Side Table.